This high quality projector wall mount bracket is perfect for mounting LED, LCD and DLP projectors on walls. This bracket is universal meaning that it will support any projector on the market. It also has 360 degree rotation and a 30 degree tilt option. It has several adjustments on the extendable arm so you can mount the projector between 29cm & 58cm from the wall to the centre of your projector. HOW DO I KNOW IT WILL FIT MY PROJECTOR? This is a universal projector wall mount bracket which means that it will fit all makes and models. It comes with absolutely everything you need in the box, including the bolts to hold your projector. You can use it with projectors that have 2, 3 or 4 mounting holes. It will support up to 15kg. 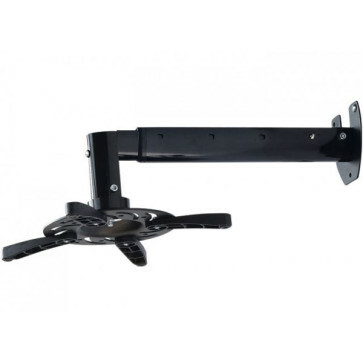 This projector wall mount bracket is guaranteed to fit all makes and models. If it does'nt fit your projector we will give you a 110% refund.